Today we bring you a doozy of an update about a driveway job gone wrong. 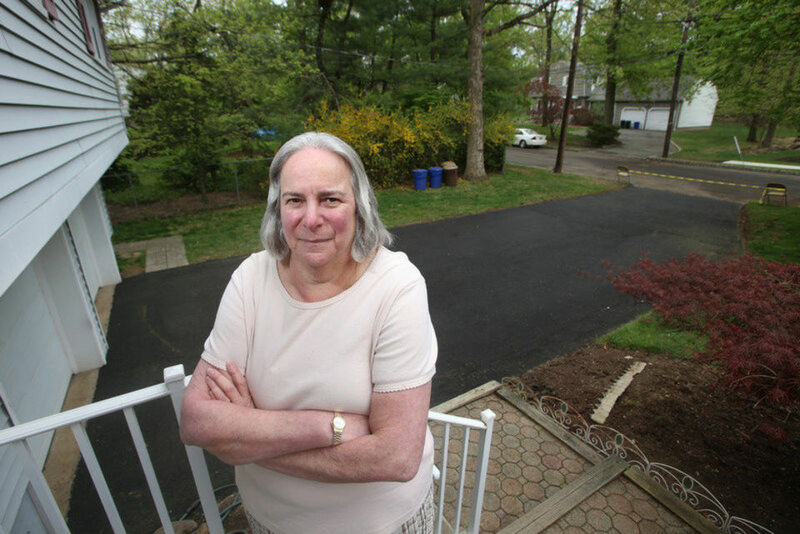 Joan Krotenberg of Livingston hired North Jersey Paving in 2012 to redo her driveway, but she said the work was poorly done. Krotenberg spent a year trying to get the company to fix the job, and she even worked with a mediator from Consumer Affairs. 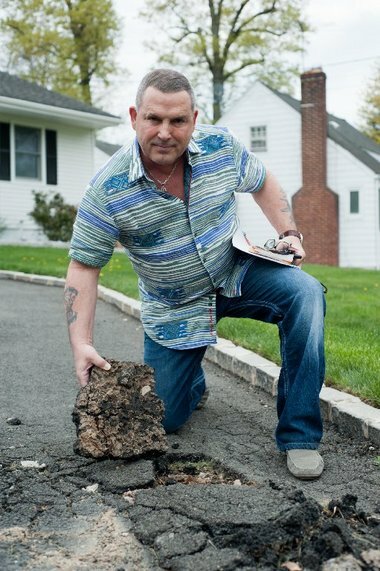 The situation was complicated because North Jersey Paving, which had an “F” rating by the Better Business Bureau and 10 consumer complaints, was co-owned by two men in the middle of a dispute. Owners William Mesker and James Gorman had a falling out, and Mesker bought Gorman out of the business. Even though Gorman was in charge of the Krotenberg job, Mesker said he’d fix it. But with winter coming, he recommended they wait until spring 2015. Mesker kept his word, returning in early May with a crew that broke up the old driveway and laid down a new one. Krotenberg said she watched the workers from a window, and she emailed updates to Bamboozled as the job progressed. First, she noticed that the two work trucks had Maine license plates and the name of a different company on the sides of the trucks. 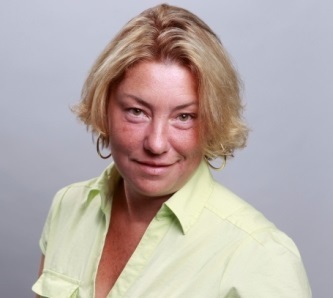 When she shared her worry with Bamboozled, we explained that it’s perfectly legal because Mesker is properly registered as a home improvement contractor in New Jersey. He’s permitted to use subcontractors. Krotenberg continued to watch the workers. Partway through the paving part of the job, Krotenberg said, the paving machine appeared to break down in the middle of the driveway. About two hours later, the work was done. “He did as promised and dug the whole driveway up and put down fresh asphalt,” Krotenberg said. She said the size of uneven part where the truck broke down was about four feet by 10 feet. Krotenberg said she also noticed uneven edging where the pavement met the grass. Plus, the pavement by her front step wasn’t right and it changed the step’s elevation significantly, she said. The homeowner expressed her concerns to Mesker. “He said he wanted it to be perfection but the only way to do that would be to dig the whole thing up again,” Krotenberg said. Mesker came to the home to view the job, Krotenberg said. The next day while Krotenberg was at work, Mesker sent a worker to touch up the uneven spot where the paver broke down. “The driveway still doesn’t look right,” Krotenberg said, noting that Mesker offered to come back in the fall to sealcoat the driveway for free. Before we reached Mesker to talk about the Krotenberg job, two other former customers reached us with complaints about North Jersey Paving. Albert Spencer said he paid the company $8,000 to do his Roseland driveway in the summer of 2013. He said James Gorman — Mesker’s former partner — did the job. But then, Spencer said, Mesker stopped responding to his emails and calls. The last response from Mesker was in April 2014, and Spencer said he hasn’t heard a word in the year since. We also heard from Traci and Chris Vassoler of Flanders. They said the paid Gorman $2,800 for driveway work in August 2014 — a month before Mesker and Gorman officially separated as business partners. While the contract the Vassolers signed said “J. Gorman Paving,” they said Gorman gave them a business card that said North Jersey Paving. By the fall, they said, the driveway was falling apart, so they reached out to the company and spoke to Mesker. “He apologized and told us the whole story that Gorman isn’t part of the business anymore, and he said he would make it right and dig it up if he had to,” Traci Vassoler said. But after that, she said, Mesker never came to the house or returned their calls. We promised Spencer and the Vassolers that we’d ask Mesker about their jobs, too. But first, the Krotenberg job. “It was nothing unusual. It came out pretty good. We had to go back and do a little touch up work but nothing out of the ordinary,” Mesker said. We asked Mesker several times about the uneven surface where Krotenberg said the machine had broken down. When we explained what Krotenberg said she witnessed about the paving machine, Mesker changed the subject, talking about a seam in the driveway. Krotenberg never complained about a seam, we said, but about the uneven paving where she said the machine broke down. Mesker didn’t answer the question. We then asked about the homeowner’s statement that Mesker suggested he might hire another company to redo the job. He didn’t answer. So we told him about the two other customers who said Mesker made them promises. “You understand I’m the person who is totally innocent here and I went out of my way to make it right,” he said. Indeed, Mesker kept his promise to redo Krotenberg’s driveway. So we gave Mesker the contact information for Spencer and the Vassolers, whose jobs were done by Mesker’s former partner, James Gorman. Gorman appears to still be in the paving business, even though a Better Business Bureau listing for the company said it is believed to be out of business. But last month, another homeowner contacted Bamboozled after receiving a flyer for J. Gorman Paving and Seal Coating. That’s the company James Gorman started after parting ways with Mesker. We did a little digging, and learned the company’s registration with the state is expired. “He should not be working if he’s not registered as an HIC,” a Consumer Affairs spokesman said. We left Gorman several messages, but he didn’t return the calls. In the meantime, Mesker did call Spencer and the Vassolers, and he promised to come see their driveways. Spencer said Mesker told him he looked at the driveway when Spencer wasn’t home. So Spencer got an estimate on a redo from another company — $8,250 — and he said he called and emailed Mesker to see if he’d pay. Mesker didn’t respond, Spencer said. The Vassolers said Mesker didn’t show up for their appointment. Traci Vassoler said she then left him a message with the couple’s contact information, but Mesker didn’t respond. That was a week ago. Krotenberg called in another paving company for an estimate. Krotenberg then emailed a proposal to Mesker, suggesting he either foot the bill for the other company, as Mesker previously suggested, or he could return the $2,500 Krotenberg initially paid for the job. “He said, ‘That’s not an option. We’re too far along in the process,'” Krotenberg said. Krotenberg spoke to the new paver again, and he said the driveway would probably look much better after it was sealcoated — something Mesker offered to do at no cost.